The aim of the day was to bring awareness of pressure ulcers to a wider audience. Lucy McNamara, a Clinical Facilitator in the Nurse Practice Development Unit was the organiser of the event. She said, “In addition to raising awareness of pressure ulcers, we wanted the event to be educational with information on how pressure ulcers could be prevented and treated in a multidisciplinary environment. “On the day we had demonstrations on skin care and inspection, repositioning and mobility awareness, nutrition advice and suggestions on how to increase patient involvement in their own care. “It isn’t a glamorous topic, but increased awareness is necessary because pressure ulcers cause pain and reduce the quality of life for the sufferer. In some cases they may even be a source of sepsis. 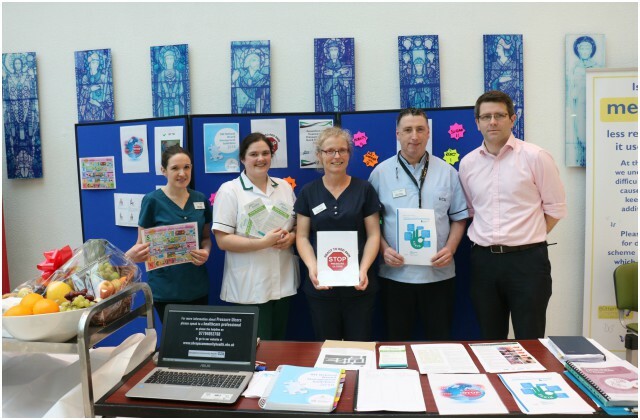 At the first ‘International Stop the Pressure’ day at Mayo University Hospital, which aimed to raise awareness of pressure ulcers, from left: Eibhlín Walsh, Dietetic Dept; Sarah Ronanye, Occupational Therapy Dept; Lucy McNamara, Nurse Practice Development; Kevin Murphy, Health Care Assistant, ED; and Gerry Burke, Assistant Director of Nursing, Scheduled Care.